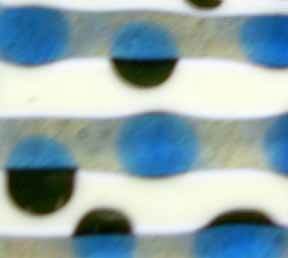 When two different glass colors are fused together, they sometimes result in a third, totally unexpected, color. When this happens, the two glasses are said to be "reactive". In most cases, the third, unexpected color is brownish. It varies in shade from light to dark, depending on the particular glasses used. The color, which is caused by a reaction between the ingredients of the two reactive glasses, appears wherever the two reactive glasses come into contact, with the remainder of each glass being unchanged by the reaction. In the photo to the left, beads of Bullseye's transparent turquoise glass (0116) have been fused to strips of clear and french vanilla opal (0137). Note that the turquoise retains its color on the clear, but changes to a third, darker color where the turquoise and french vanilla have touched and reacted. When two reactive glasses fuse to form a third color, the compatibility and soundness of the glasses is not affected. Only the color has changed. Click here for information on the chemical ingredients which make up reactive colors and seven different ways in which they can react.